Forty-three acts will compete at the Eurovision Song Contest 2018 in Lisbon, but there can only be one winner. To help you make an informed decision about where to cast your vote, the Wiwi Jury — our in-house panel of music unprofessionals — has previewed and reviewed each of this year’s acts. It’s hard work being honest, but somebody has to do it. Our jury consists of 20 jurors who hail from Australia, Bulgaria, Iceland, Ireland, the Netherlands, New Zealand, Portugal, Romania, Serbia, Spain, the United Kingdom. We are truly international, y’all! Each juror assesses each song independently and then awards each song a score from 0 to 10. The highest and lowest scores are then dropped to determine the Wiwi Jury average. Reviews were made in March 2018 and are based on available versions of the songs at that time. As always, Wiwi Jury reviews will not be changed to reflect new information from pre-party performances or the Eurovision rehearsals. I’m amazed how low quality taste has Europe for music these days. Is this a circus or a song contest? Because I simply don’t see a lot of quality in the winning song. In the same time quality songs with great live performances and really strong messages has disappeared in the final chart. I don’t want to offend anyone but Moldova and Denmark in top 10?????????? Are you for real? In 2018? Yet all Wiwi Jury winners have consistently placed in the top 10 at Eurovision. and 2018 #1 winner was spot on! Well done! It’ll be decided in May in Lisbon but some numbers are hard to dismiss. In the end it all comes to personal taste isn’t it ? It’s time for my ‘douze points’, based on what we know as of today. I’ve noticed it changes the night itself because staging does a lot. and finally Bulgaria 12 points. We restrict the number of written reviews per post to keep the size of the post at a manageable number and to keep the workload reasonable for our team. The written reviews are allocated in early March, sometimes before some NF winners have been selected. The allocation is mostly random, but we do prefer to have at least one jury member who can review the song of their own country. OK, thanks for the reply – I can now sleep peacefully. Very overrated: Belgium, Sweden, Czechia, Spain, Ukraine, Portugal. Very underrated: Azerbaijan, Hungary, Greece, Australia, Germany, Poland, Denmark, Lithuania, Russia, Ireland, Romania. Disagree with Israel first but it was to be expected I guess (gays and divas lol). At least it’s a song with a message (thinking of Cyprus and Azerbaijan). I really thought wiwi was gonna give it to Bulgaria… Well it doesn’t matter much, as seen by these two last years, fan voting is often miles away from the general audience. Italy 17, Belarus 29, Hungary 19… What you hear? We hear the same songs? I can’t believe it. Feminism is not a joke. It makes me sad Toy: banalization of things that affect women of all the world with insults and chickens it’s the saddest thing I ever see in this contest. Now that the wiwi jury top is known, we know the odds of Israel actually winning come finale night got worse, and by winning OGAE, even more unlikely. So then, who is left that can win? I’m betting either Belgium, France, or Italy, – and possibly Bulgaria. But those are just my guesses- and nothing but guess. I don’t think I’ve ever seen a year where the winner is so unclear. A lot of songs are solid. Russia is higher than Norway? Whaaat?? Is this an autotune contest? No, Alexander just sent in a genuine disappointment of a song. I mean, it’s not an AWFUL song- but we know what kind of music he’s capable of making and this song is below average for him. Oh, really. Belgium is better than Bulgaria, Estonia, Ukraine? I don’t think so. I think that everything will change after live performances in Lisbon. Wow, this ranking! 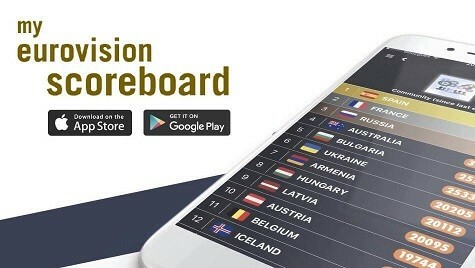 Austria at #3, Spain at #6 and Belarus at #27?! You guys are living in a parallel universe! her performance in amsterdam was better than in Israel so that’s a plus. Her WHAT now? What are you trying to say? “Desafination” isn’t a real English word. It doesn’t mean anything. No Equinox do not have a better song than Sennek. At most, they have a more high impact song because of the harmonies in the voices and 5 singers. But Belgium has class. Had you listen to her performance in Amsterdam you would have seen she was only out of tune in Israel. No mention of her horrible live vocals whatsoever. I do think she can improve but if you’re going to rank some entries based on bad vocals showcased in live performances such as the NF ones, then do it for everyone. Or just rank everyone based on studio. *cough cough* Belarus. As explained elsewhere this ranking is established somewhere in March I believe and they are not allowed to modify their votes later on depending on live performances or other occurrences. At leats the rules are clear. Don’t understand that either. But I doubt that it’s been anyone’s fav, so while it does and will do good with juries ranking all of the songs, it will likely fail in the televote just like Austria, Australia and Denmark last year. And actually I think the same about Belgium, although it gets even more hype in the bubble. Some people say that the Czech Republic could be a surprising non-qualifier but I can rather see that happening to Belgium and Austria is far from safe. Can’t understand the high ratings of so many songs. As with most years many of the songs are pretty ordinary but are really hyped up in the reviews. Sweden in the lead doesn’t make sense to me also, but then Sweden never seems to do wrong in Eurovision land, regardless of the quality of the song! Is Wiwibloggs saving the best for last ? they are doing a countdown. I will never understand Robyn’s reviews. She gives Fuego a 8.5, and this just over a 5. I don’t know… I see Spain either winning the final because many will just feel the emotion of the song, or ending way in the bottom. I can’t see any other option for Spain this year (unless theres a huge public/jury split). Two reasons: we wanted to keep it smaller so it was easier to manage. Also, this year only 26 people wanted to be on the jury, so we couldn’t even have done 38. We looked at statistics and the overall averages last year were roughly the same with a smaller sample, compared to the full 38. Shamful that the masterpic from Estonia is just 0.06 ahead of Cyprus among wiwiblogg reviewers. REALLY???? The song is a bit divisive; not everyone is into opera. Some people really love it and others don’t, but they respect her talent. The result is an average score. The Cyprus result is a bit shameful indeed. The most respected esc fan site collectively endorses a “diva” who may or not be able to sing live, a song with no special meaning, which she did not compose and in fact was made for another artist to sing. To me this is the most fast food song of the year, acceptable yes, fun at times sure, but not for top 15, less alone number 2 (at the moment). As I said, I like the song. But in the upbeat songs section, FYR of Macedonia, Ukraine, Finland and Sweden are all above that one. For my taste that is. And they all seem much better artists than Eleni. Last, I did use more arguments than the can se he sing, cant she. But that’s just the thing. The jury isn’t a device for speculation on live vocal potential or the final package. It’s a judgement on the studio cuts of these songs. Cyprus’ studio cut is good, and assessing it based on its studio cut alone, its position makes complete sense. If things fall apart in Lisbon, the coverage there will most likely testify to that, but if all they have to judge the song right now is the clean, studio version, the marks will show the quality of what is available to them. I agree, for me, Cyprus, Azerbaijan and Slovenia are highly overrated in this list, and Denmark, Lithuania and Norway are underrated. For me the answer to that is pretty simple. Have you ever listened to just the instrumental of “La Forza” by itself? Without the singing. Well I know you are biased against Rybak, Norway and don’t get it is a song written to be performed in a family show on TV. Well, there are of course more interesting songs.I am happy you put Switzeland up, because I really liked them in London, but Lithuania should be further up here. Who chose this boring order for score reveal? It seems that one country keeps getting added on top, one in middle, one at the bottom! So we already know that none of the ones which are already up are near the top! Why not choose a more random order? I came up with it and it took me about two weeks to finalise, with numerous trials. Past experience has shown that random order doesn’t work. Some readers get really upset when a song spends too long sitting at the top or the bottom (especially when it’s one they strongly dislike/like) so we have to ensure things are mixed up a bit. And we also want to keep some of the more interesting scores until later. It’s the Wiwi way! The preferential vote means that the song that came out on top had more top scores, isn’t it? Macedonia first???? Azerbaijan third???? Ahead of entries like Denmark, Croatia, Poland, Latvia, Malta, Serbia and Armenia?! Gosh……. CONGRATS WIWIS MACEDONIA FIRST ANS NORWAY LAST THIS IS HOW MUS TO BE. FELICIDADES BIEN VOTADO. Hi guys! I’m running a poll about Eurovision 2018! The first step (the semi-finals) is already done but you can still vote in the most important part: the Grand Final! Your comment is worse nonsense. That’s like saying that everyone’s top should be the same with the final results. Looks like you are not celebrating diversity! The Wiwi Jury is not intended to be a prediction of Eurovision qualifiers or winners. It’s literally just how members of Team Wiwi feel about the songs. If want dispassionate predictions, check out a betting site to see the latest Eurovision odds. Why Lithuania still haven’t got its review video ? Is there a way to upvote this comment? Because it needs to be seen and the question needs to be answered. There are now five reviews up that don’t have a corresponding review video. It’s not like they require heavy editing. They’re one take on a couch in someone’s flat! It might not be heavy editing but the videos still require editing. All of Team Wiwi do our work in our spare time and sometimes other things take priority. In this case, we put the Wiwi Jury work on hold to ensure that the videos from the London party could be published in a timely manner. These are just their opinions, far far away from the Eurovision reality. In 2017 their winner Italy ended up on the 6th spot in the grand final, same as their 9th place (Israel) = 24th in the grand final. Others, like FYR Macedonia (5), Finland (7), Estonia (11) or Serbia (12) didn’t even make it to the final… Romania (31) ended up on 7th place in the 2017 grand final, while the actual winner, Portugal was on #29 in this wiwi jury chart, so….that being said, things will be completely different in May. Good luck to everyone! That’s interesting, but I like the rating system too, maybe even much more. I was just saying it isn’t very relevant as an indicator for the contest. I think you should do both.